2Lt Raymond Hofmann (P) - Flew on five missions as CoPilot with the 2Lt Quentin J. Gorman Crew (109, 110, 113, 114,115). Upgraded from CoPilot to Pilot on 3 March 1943 and flew on seventeen credited missions as 1st Pilot with five different CoPilots (116, 118, 119, 120, 122, 123, 124, 125, 126, 127, 129, 132, 134, 135, 136, 139, 140) - Eleven with 2Lt Calvin S. Brothers as CoPilot. On 24 April 1944 mission #140 to Oberpfaffenhofen, Germany in B-17G #42-31669 Shoo Shoo Baby (358BS) VK-J. Lost one engine during a fighter attack before reaching the target. Another engine was lost when hit by flak near the target. Its propeller ran away and could not be feathered. Realizing that they were badly damaged and low on gasoline, the crew opted to head for Switzerland. 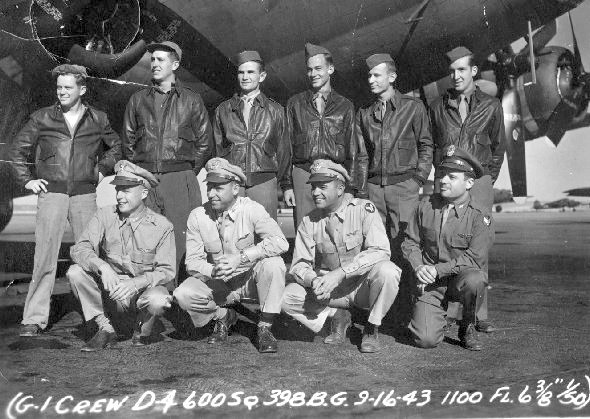 They landed at Zurich with twelve flak holes in their B-17. All classified equipment was destroyed before landing, including bombsight, IFF & CHF equipment, flimsies and maps. 2Lt Elmer P. Israelson managed to escape from internment and returned to England. Substitute crewmen on mission: 2Lt Robert W. Snyder(CP): 1Lt Samuel Minkowitz (N); Sgt John W. Bahr (LWG); S/Sgt Tracy W. Lawson (RWG); S/Sgt Thomas P Hickey (TG).